I’d not made a proper pad thai before nor had I deep-fried anything, so I decided to do these popular Thai treats for dinner. 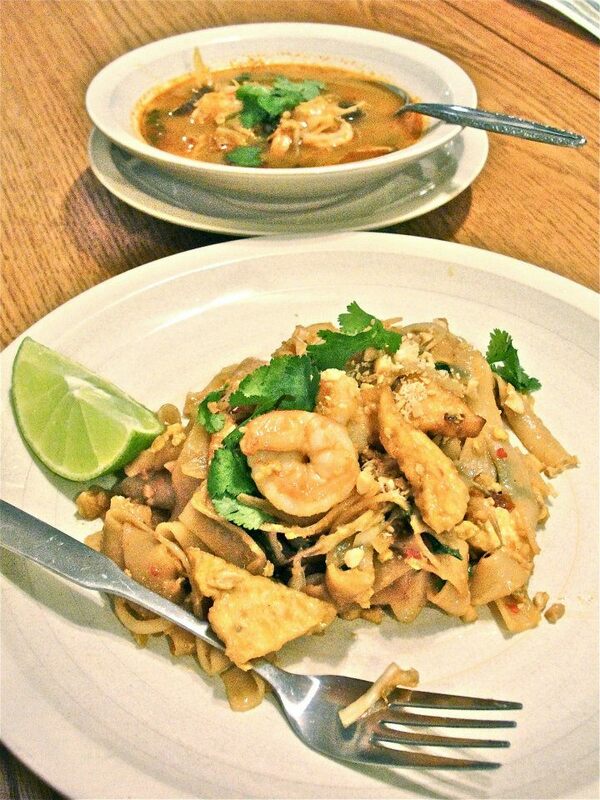 The pad thai has shrimp and tofu – the firm tofu was cut into ~1/4″ thick triangles and deep-fried in peanut oil; other ingredients include: peanut oil, scrambled egg, sesame oil, rice noodles (banh pho), bean sprouts, thinly-sliced green cabbage, minced garlic, shallot, scallion, finely-diced serrano pepper, crushed dry thai bird peppers, soy sauce, fish sauce, water, sugar, natural peanut butter, chili garlic sauce, lime juice, and chopped peanuts. Served with fresh lime, chopped peanuts, and fresh cilantro leaves. The soup was prepared simply using Tom Yum Paste from a jar (Lee brand), with sliced fresh black mushrooms, bean sprouts, chopped green cabbage, sliced jalapeno, minced garlic, shallot, shrimp, and topped with fresh cilantro leaves. I consulted the following recipes for ingredient ideas.